The Strathbogie Sustainable Forests Group (SSFG) is a community group based in the Strathbogie Ranges and committed to improving the management of public forests. Some of our correspondence in the media, with politicians and Agencies is shown below. 31.3.16 – Planned burn undermines government credibility. 11.9.16 – VicForests gives ‘the finger’ to local group. 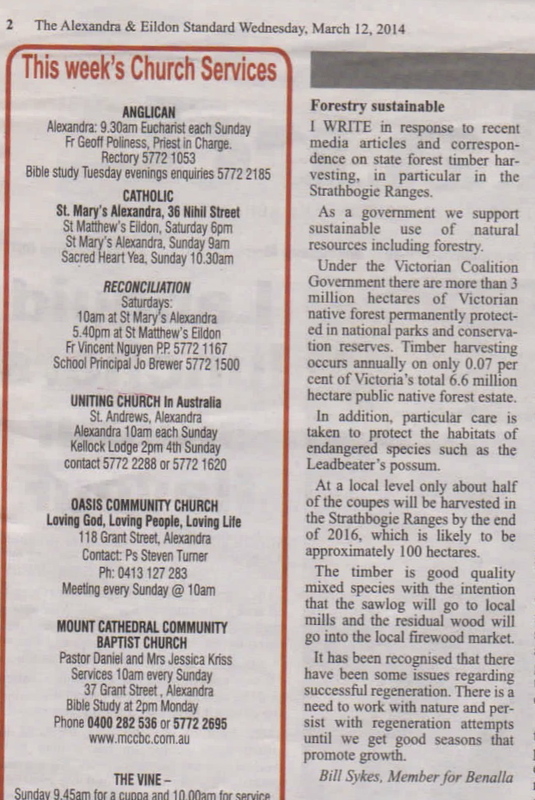 24.9.16 – VicForests’ deceit angers local community groups. 4.3.16 – Response from DELWP Regional Director, Hume. Link to Barjarg Rd burn map referred to in the response. Please be aware endangered Spottailed Quolls (also known as Tiger Quoll & Spotted Quoll) reside in the area. This is the largest of the Quoll and the only other known remaining location is in the Otway Ranges. They have a large territorial range.